Foreign investment into India has gone down substantially despite surging domestic economy as global investors remain wary of uncertain world economy. 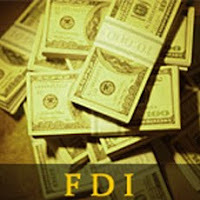 Foreign direct investment (FDI) inflow into the country during the first seven months of the current financial year (April-October 2010-11) stood at $12.40 billion as compared to $19.95 billion in the corresponding period of the previous year, thus recording a decline of 37.8%. FDI inflows have gone down due to sluggish global economy and uncertain outlook. A recent study by the World Bank had pointed out that FDI flows into developing countries, including India, were set to recover over the next couple of years and projected them to increase by 17% in 2010. However, the uncertain economic scenario is dampening flow of direct investment, opine the finance ministry officials. FDI in India stood at $25.89 billion in the last financial year. The government had set an FDI target of $33 billion in the current fiscal.